Catalonia is seeking separation from the rest of Spain. Full Separation. 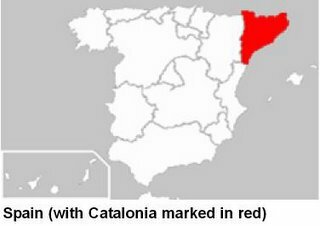 It wants Catalan (spoken by over 6 million people) to be its official language. I am not sad seeing Catalonia taking control of its own region, as this its right, but I am concerned about the breakdown, fracturing of Spain. I know Yugoslavia historically differs, but the same fracturing is likely to mirror itself in the Iberian Peninsula. The Balkan states had bitter differences in terms of ethnicity and language, but how will the Spanish other regions take Catalonia’s sense of independence? The level of autonomy granted to each region in Spain is far from uniform. Catalonia, the Basque Country and Galicia have special status with their own language and other rights. Andalusia, Navarre, Valencia and the Canaries in turn have more extensive powers than some other regions. Asturias and Aragon have taken steps to consolidate language rights. It is a complex and evolving picture. As emotions run high in Madrid, with an army general asked to resign for mentioning a military option to save restoring the Spanish national geographical integrity, and political tension bubbling up one hopes no blood is shed in the process. My concern is European Integration. The Anglo Saxon drive towards a looser Union of states where trade is fostered and economy boosted (all very good) is likely to perceive the emergency of regional autonomies, and micro states (like Malta) as good stumbling blocks in the road for European political integration encouraged by the Maastricht Treaty. If the UK presidency of the EU during 2005 hammered an issue during its reign it was surely the issue of economic rather than political integration, sidelining France and Germany (that mostly favoured political unity, counter balancing the US) labelled as the Old Europe and hailing free market economies as the new future. Where do us Maltese fit in, tiny as we are? Maltese, unlike the Irish (who preferred English) or Luxembourgeois (who opted for French) or the Catalonians (who reluctantly retained Spanish, notwithstanding having a language that pre-dates Maltese), demanded and obtained recognition as an official EU language. We had the support of, guess who? The British! They were firm supporters of the Maltese government, amongst some others, in our pursuit for official language status. Once again the British (unwittingly?) made Maltese a Trojan horse for their ulterior political motives. In the early 20th century the Brits supported the introduction of the local vernacular as the new national language. British advisors at the time even encouraged the Arabic alphabet for use in writing in this ‘new’ language in view of what they deemed were its identical roots of origins and use of a mainly common vocabulary. They had it there way by supporting the emergence of an organised local pro-Maltese language academy. This academy appointed a local poet, a Catholic priest from a rural area who wrote mainly in Italian until then, to lead in its championing the cause. Maltese served the British ulterior political motives, of ultimately securing the dominant place of the English language in Malta, and in encouraging the decline in long standing cultural and political influence from Italy and the Italian language. And who supported Italian up till that moment in Malta? It was the political classes in opposition, the Catholic establishment, the professional classes, leading clerics and the good chunk of the educated, city dwelling citizens, in other words, most people with a vote at the time. Anyway. Its history now. English made political sense for adoption by the Maltese since the early part of the 20th century. Italian was passé anyway. Its political prowess crushed with the defeat of Mussolini. Its cultural and literary marvels traded for the economic leverage ensured by the second option, English. English became the new lingua franca. At that time the use of English aided trade with the rest of the enormous British Empire and saw the significant emergence of a local middle class, made up of traders, service employees, civil servants, and a host of British educated professionals (in contrast with the old established 'Italian' trained ones that formed the upper classes till the mid-20th century Malta). This was no mere change as in time it brought about the emergence of new political realities in this tiny island that would have lasting effects to this very day. English, not Maltese won in the end. The European Dream. Is it Over? It was always fascinating for me the notion of a single European state, currency and why not a common language too? The Babylonian model, where a multitude of languages rules is a monumentally flawed one. So why emulate it? Europe can build on its strengths of diversity and combined economic might by building bridges where there are rifts in perception. Putting blind pride aside, how stronger could the EU be with one language as its main medium? Painful as it surely is for historically meaningful and rich languages such as French, Italian, Spanish or German, the option of a common language makes sense. And strength is not measured solely in economic terms. With a stronger EU parliament, against a fractured multitude of states and increased members all pulling their own agendas us Europeans stand to gain more rights and benefits. A common language means no neglect for regional or national languages. It merely helps creating a better working, less bureaucratic EU. And I believe the English language (not the current English political class) qualifies fully for this role. I am not encouraged by the events in Spain. Nor am I encouraged by the passivity of many Maltese to the EU reality. And please, stop saying we joined Europe, as we did not! Malta was always in Europe and it would have stayed in even if it decided not to join the European Union (EU). We joined the EU, that’s a political multinational body for greater integration with those countries that have given up the sovereignty for a joint one amongst states sharing its history, culture and political ambitions, not just economics. Even our mainline heated discussions over the EU issue prior to the referendum focused too much on economics and less on culture and politics. Good morning Malta! Waking up to a new reality? I don’t know but as the more I read through most of the local newspapers the more I convince myself that we ought to replace our country’s name with ‘Lilliput’; The Euro or Ewro issue, the dreaded coin with the pathetic choice of images for selection…Enshrining abortion in the constitution…Mamma mia…scary staff…are these just a smoke screen? Is there another picture? And whilst the EU parliament debates the Boundaries of Free Speech and the future of an EU less dependent on crude oil, sending EU military observers in Congo, most Maltese radio discussion shows, newspaper letters and TV discussions were hotly debating whether tele-voting should be retained in next year’s Song for Europe Contest. A question of priorities, I suppose.